This album is like the tide coming in. Its a constant pleasure that keeps coming at you, song after song. Listen to it a few times and the waves reach further and further in, until you are overwhelmed. The songs are spiritual. Once you allow yourself to leave the shore with this music, you find yourself in deep waters with a good rower in a boat of faith. Dont let the "S" word scare you off. This is the work of a devout man, but it is never preachy. Spirituality is Pettiss way of approaching the mystery of our existence and in his music it serves as a profound center for his stories and emotions. But the reason that this album is a treasure is the same as any other great record, songwriting, performance and production. Pettis has been a fine songwriter for yearsfrom his days at New Yorks Fast Folk in the 1980s, to his work at the Muscle Shoals Sound Studios, to his recent stint as a major-label staff writer in Nashville. He has been covered by everyone from Dar Williams to Garth Brooks. His performance style is a curious mix of passion and restraint. His voice is quiet and warm, yet it conveys powerful feeling when the songs venture deep. His guitar style is similar to his voice, full of fine picking, yet capable of punching out acoustic power chords for emphasis. Pettis is abetted by guest musicians such as Lynn Williams, Garry West, Tim OBrien, Stuart Duncan, Colin Linden, Clive Gregson, John R. Burr and Alison Brown. Background vocals are handled by Claire Lynch, Gordon Kennedy and Jonell Mosser. This is basically a "whos great" list of people who sing and play original, non-commercial music on guitar, fiddle, bouzouki, banjo, keyboards and other instruments. Commenting on the sound of this album, Pettis differentiates it from his previous work. "Its folkier than many of the other albums I have made, but it is also more aggressive. The guy on drums, Lynn Williams, plays for Delbert McClinton, so he is an old-school, red-dirt, rock-and-roll drummer. He plays a lot like the old Muscle Shoals drummer, Roger Hawkins. On my previous album I worked with Steve Brewster, who is more of a Jim Keltner type drummer". Many of the songs have a theme of place and of growing up in the South. Often the perspective is of a man looking back on events in his life, through the lens of maturity. That all of these songs wound-up together is something that was apparently meant to be, but not planned that way from the beginning. As a contract songwriter, Pettis finds himself writing more songs than he can actually spend the time getting well acquainted with. When he writes a song, he makes a demo and files it. When it came time to record this album, he had a huge selection of songs to choose from. He mailed demos to fans and friends to help select songs for the album. "There were three CDs of twelve to fourteen songs each. One was labeled fast, one was slow and one was medium. I wanted them to pick four songs from each one." Oddly enough, the lists came back with unanimous choices for many of the songs and a clear consensus for the rest. 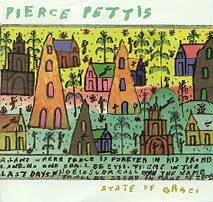 It was only after this process was under way that Pettis became aware of the unifying current of home that would run through this record. It is so often hard to put into words exactly what makes one song outstanding and another ordinary. The most memorable songs are often the simplest, with the magical quality of being enjoyable from the first listen and more poignant on subsequent spins. The opening lines of the title song are a good example, evoking more than they say, as they are sung with simple conviction. "We Will Meet Again" is again a very clear song in a narrative way, yet it lives on both sides of deaths great divide, bringing tears of sorrow and hope to my eyes whenever I hear it. Pettis manages to avoid the maudlin possibilities of this theme, respecting his audiences ability to supply its own sorrow, concentrating rather on his belief in joyful reunion. "In the middle of forever/ In the company of friends/ We will meet again." The songs that deal with less ultimate themes are no less memorable. "Georgia Moon," about a goodbye date in a Confederate cemetery in a "fuselage of fireflies," is full of fondly remembered sensual detail and bittersweet recollection. "Little River Canyon" is a subtle look back at small town origins. It reflects with humor on the local lovers lane "You could hold your baby/ Like a floatation device/ Bobbing to the surface, coming up for air/ In a tangle of tongues and teeth and hair." But it also explores the larger question of ones ability to come home. "Some left for college, some could only dream/ Hanging around town, still wearing their high school rings/ I avoid their faces when I come to town/ Man, I still dont know which one of us/ has let the other down."